With your patrons’ entire history in one place, PatronManager helps your box office provide even better service. PatronManager’s mobile-responsive ticketing experience ensures your patrons can buy tickets on their mobile device wherever they are. Plus, we’ve made it simple for you to customize and brand your own pages to match your organization’s website, so patrons know they are doing business with you. You can build a lasting relationship with each transaction. Did you know that as many as 80% of first-time ticket buyers never come back to your organization? Learn how PatronManager can help you solve this business problem. PatronManager gives box office professionals the power of information. Offer branded, mobile-responsive ticketing for smartphones and tablets. 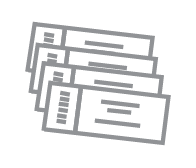 Provide printed or print-at-home tickets. Help patrons post to social media and invite friends to buy tickets, and engage with them on LinkedIn, Twitter, and Facebook right from their contact page. Get real-time box office reports and financial reports, on demand or automatically by email. White paper: Learn how CRM will revolutionize your box office. Deepening your relationships with your audience requires unified customer history from box office ticketing, fundraising, email marketing, and staff collaboration. This white paper explores how customer relationship management (CRM) combines all of these systems, helping you sell more tickets, target your marketing and fundraising efforts more effectively, provide better customer service at the box office, and make your organization more efficient.